Members of UCL-Energy last night teamed up with the New Economics Foundation and the Royal Academy of Engineers to put on an event on low carbon housing. 'Low carbon homes - What should be our priority in reducing electricity demand from our homes?’, held at the Dana Centre in London, was one of a series of twelve funded by the Royal Academy of Engineering under their Ingenious grants scheme. The Crowdwise: Engineering the future of housing event began with a brief overview of potential approaches to reduce energy demand from buildings. · what the surveys tell us about the actions people are willing to take to save energy now and in the context of an energy crisis. The audience then developed their own suggestions and voted for their preferred options. The event demonstrated how challenging it is to develop practical options to encourage consumers to use less. An overall preference was expressed for market measures to encourage behaviour change. 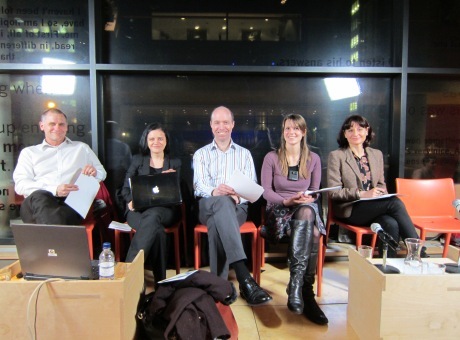 Image from L-R: Dr Mark Barrett, Dr Catalina Spataru, Dr Jonathan Radcliffe, Stephanie Gauthier, Aurore Julien.